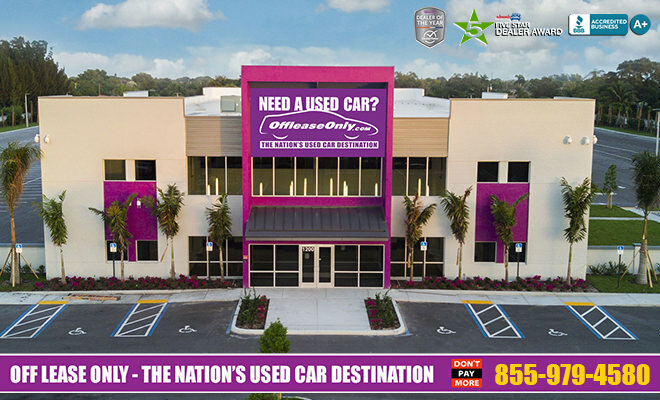 OffLeaseOnly was started by owners Mark & Eileen Fischer with a vision to provide a unique car buying experience. They started with two cars that they bought with their life savings and have grown their business into the largest volume independent car dealership in the Nation. This has happened for two reasons — caring that every customer has an excellent experience and by selling cars thousands below retail. People fly in from all over the country to take advantage of the lowest prices on quality used cars in the Nation. Off Lease Only provides an environment free of all of the typical car dealership shenanigans that have ruined the car industry. At OffLeaseOnly you will never pay a dealer fee, never have the additional stress of negotiating price and never deal with any harsh sales tactics. The prices are clearly marked both online and on the lot, a free Carfax report is provided on every vehicle and extended service agreements are available for up to 10 years and for unlimited miles for qualified vehicles from the date of your purchase to add additional peace of mind. Off Lease Only also works with all of the major lenders to provide excellent car financing rates. Experience the difference at Off Lease Only!